Discover my top 10 insider secrets on how to create a beautiful feminine image. Learn the #1 thing all successful crossdressers and transgender women have in common. Get FREE instant access to this 3-part video program! Discover how hypnosis can help you feel more confident about expressing yourself as a woman. Let go of your subconscious masculine programming and reconnect with your true femme self. Get FREE instant access to this 8-minute hypnosis mini session! Discover pro makeup techniques for bringing out the beauty and femininity of your face. 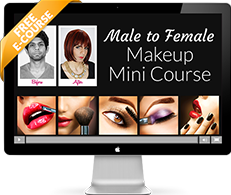 Get FREE instant access to 3 video lessons taught by renowned makeup artist, Chris Scott.